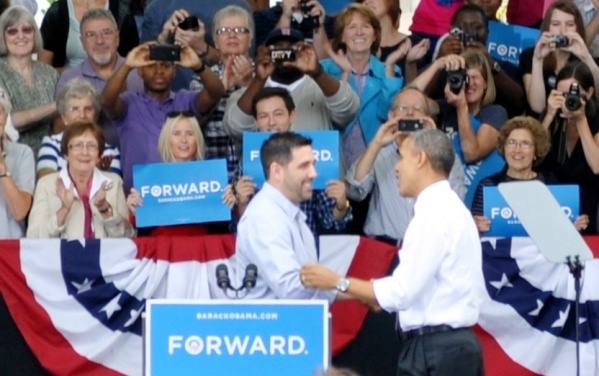 IAM Local 1947 Vice President Andrew Hounshell (left) was chosen to introduce President Barack Obama at a campaign rally in Cincinnati, OH, where the President vowed to protect U.S. auto and steel workers from unfair duties levied by China on American-made cars. IAM Local 1943 Vice President Andrew Hounshell admitted he was stunned to receive a phone call inviting him to introduce President Barack Obama at a campaign stop this week in Cincinnati, OH. “I was dumbfounded,” said Hounshell, who is employed at AK Steel in nearby Middletown, OH and was chosen from several union members in the region with ties to the auto industry. President Obama’s campaign stops across Ohio this week are focused on the recovering U.S. auto industry and China’s use of export subsidies to gain unfair advantage.